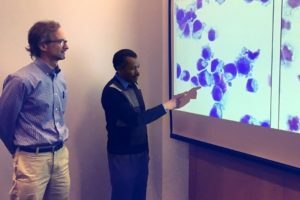 MSTP mentor, Adam Goldfarb and his team have recently been recognized for their research in the area of blood platelet creation and the “Master Switch” that could assist in the production of platelets specifically in neonates. Nearly 30% of preemies are affected by neonatal thrombocytopenia and many will require platelet transfusions. Read more about their exciting discovery HERE.